Welcome to a special edition of the Bed and Breakfast E-Traveller. We would like to take this opportunity to introduce our new gift certificates, as well as tell you about our latest contest with Norah Jones. BBCanada.com and EMI Music Canada Inc. are pleased to announce the Norah Jones Valentine's Day Contest! 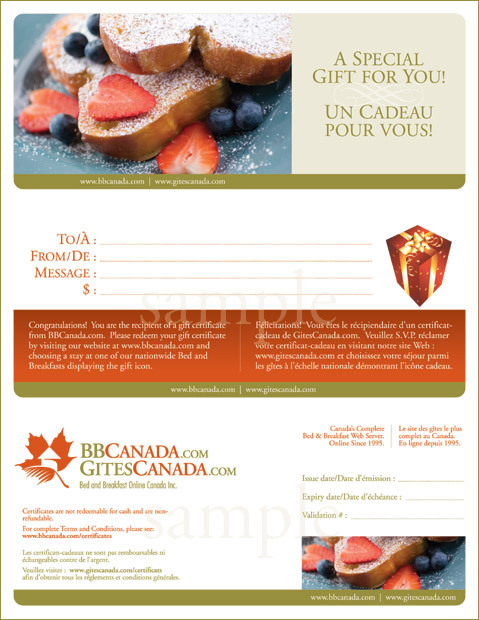 Grand Prize: One BBCanada.com gift certificate (valued at $300.00) for a weekend stay for two at any participating B&B that accepts BBCanada.com gift certificates, PLUS a copy of the new Norah CD “Not Too Late” (Total value of Grand Prize $315.00). 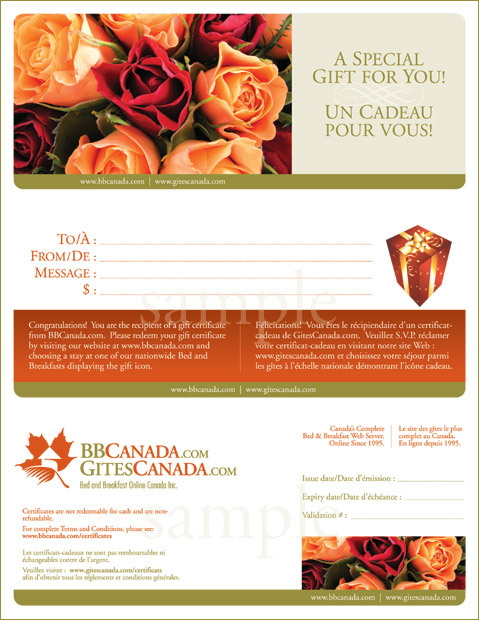 Please visit www.bbcanada.com/norahjonesvalentinesdaycontest for complete contest details. This contest is open to all residents of Canada, excluding residents in Quebec. Contest ends February 14, 2007. For more information, please see our terms and conditions. 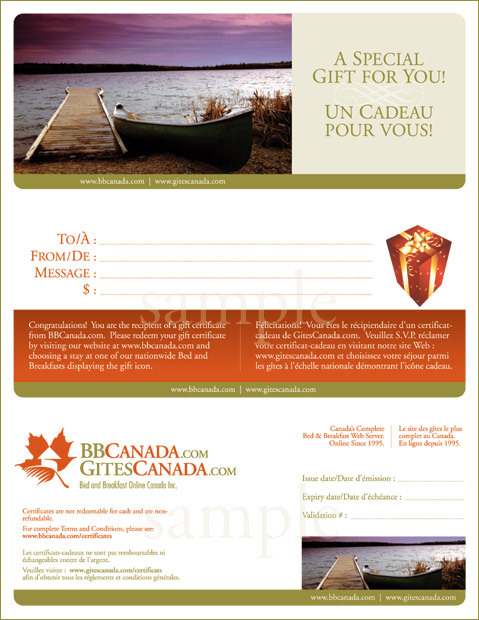 You may select one of 6 beautiful images to appear on your gift certificate. 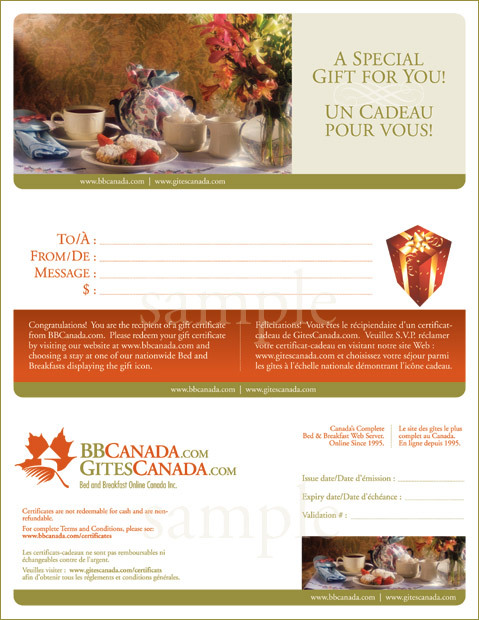 They can be purchased in any amount up to a value of $250 and may be used at any B&B on our site that displays the BBCanada.com gift certificate icon. 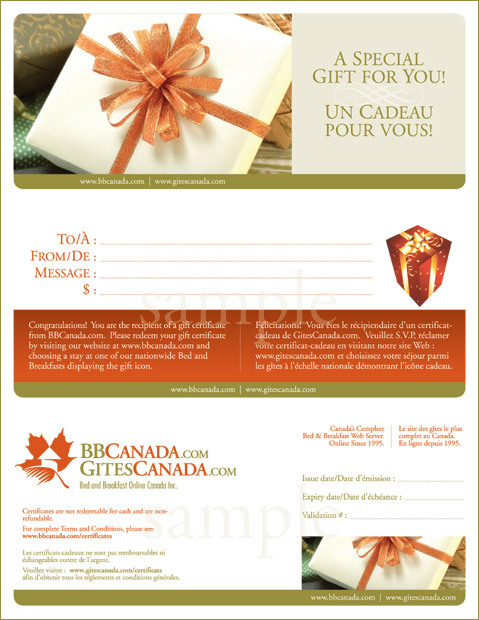 To purchase a BBCanada gift certificate, please visit our payment centre. By purchasing a gift certificate, you will automatically be entered into our Norah Jones contest. If you have any questions, please don't hesitate to contact us at info@bbcanada.com or 1-800-239-1141.